INCREDIBLE!!! Absolutely, unputdownably incredible!!!!! It’s intense, romantic, shocking, deep, funny, and so real. I devoured this one, and gasped at that jaw-dropping moment that had me clapping with glee, delighting in the trouble that was about to ensue! And oh boy am I embarking upon it, ’cause this is a duet and there’s a HUGE reason for that! This story could not be told in just one book. ABSOLUTELY 5 stars!!! *oooooooof!!! * My review is coming next! And I am DEVOURING book #2 (The Brightest Sunset (The Darkest Sunrise Duet Book 2) ASAP! Melissa: Me too!!! So so good!!! Bardee: I just finished The Darkest Sunrise….eeeeekkkk…what an emotional roller coaster in the best of ways! So so good…How am I gonna wait 8 days to read The Brightest Sunset?!?! Maryse: Bardee!!! I LOVED IT!!!!! DYING for the next one !!!! yes. Lots of exclamation points but they’re warranted. Jean: read The Darkest Sunrise! I’m almost done and devoured it in less than 24 hours!! Angie: OMG. I LOVE this one too. Bk #2 is on my kindle, but I am sick over the thought of what’s going to happen and haven’t started reading it. I’m such a wimp. Hahahahahahah. Maritza: Just finished. 5 stars for sure. Is the 27th yet?! Maryse: I’m reading the next in the Aly Martinez duet. I have an early copy, and there is NO WAY I can keep myself from reading it after THAT ending… I can’t wait!! … that ending had me scrambling. And yep, sure, this one ends on a cliffhanger, but it was well-rounded, right to the very end, considering. 😉 That said, book #2 will definitely complete this story and I can’t wait to start it. Luckily for us, it’s going live in just a few days. :D!!! Luckily for me, I have an early copy and as soon as I post this review, I’m jumping in. Tee hee! ..and yet when they finally meet (she’s a renowned doctor and his young son needs her), and let go just enough to become friends, they soon realize that they seem to complete each other. There it was, blazing in her eyes. I’d perfected the ability to lock my every emotion away. Hiding them from not only the world, but myself as well. If I didn’t enable the pain and fear, they had no power over me. But, as the years had passed, the hollowness left behind had been worse. They get it. Each one has their own way of dealing (or NOT dealing with their triggers), and they truly connect, and let each other just… be. Porter might have wanted company in the darkness. But, with a single taste of the warmth, I wanted to bask in the sunlight. Finally. Light at the end of that dark tunnel. For those two hours, the world kept spinning, only this time, I wasn’t frozen in place or sprinting to keep up. Porter and I spun together. I didn’t know it yet. But those four simple words changed my life all over again. 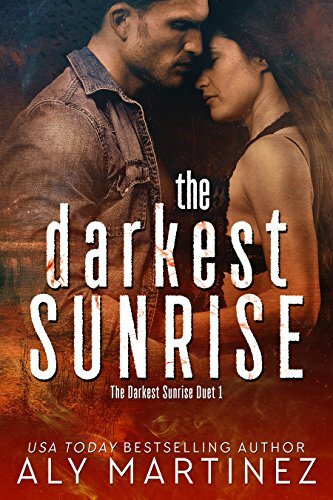 There’s not much more I can say, for fear of spoiling the journey, other than I love this story (and these characters) so much, that I will continue reading it (the sequel ➔ The Brightest Sunset (The Darkest Sunrise Duet Book 2)) right now. I’m HOOKED! Someone is being very vague. Awesome review, Maryse. I’m planning to read this book but I’m waiting for book two released before jumping in. The reviews have been insanely awesome and yours has made me “arrrgghhh”. Can’t wait to start it! Counting the days until The Brightest Sunset releases so I can start this duet!!! So not light beach reading, eh? I need beach reads! Headed on vacation this week. When book two comes out, I might just have to revisit this one. Great review Maryse! I couldn’t put this book down either! Rereading the quotes above gave me the feels all over again! I love them both! This is my next read, but you guys have to read The Sound of Light by Claire Wallis!! Omg! I am trying to remember when a book has touched my heart like this one did! !